Everyone’s played that classic game of connecting pipes before the water starts to flow. You need to make sure you can get the water from one point to another, urgently juggling pipe sections and keeping an eye on the clock! But what if you weren’t just racing the clock, but other plumbers? In the tradition of Water Works, Downspout is a pipe-laying pattern-making game, where you’re not just using the pipes in the queue, but can steal pipes from other people! You need to balance building a perfect network of pipes with sabotaging your opponents’ pipes, all while hoping you don’t run out of time for the FLOOD to start! 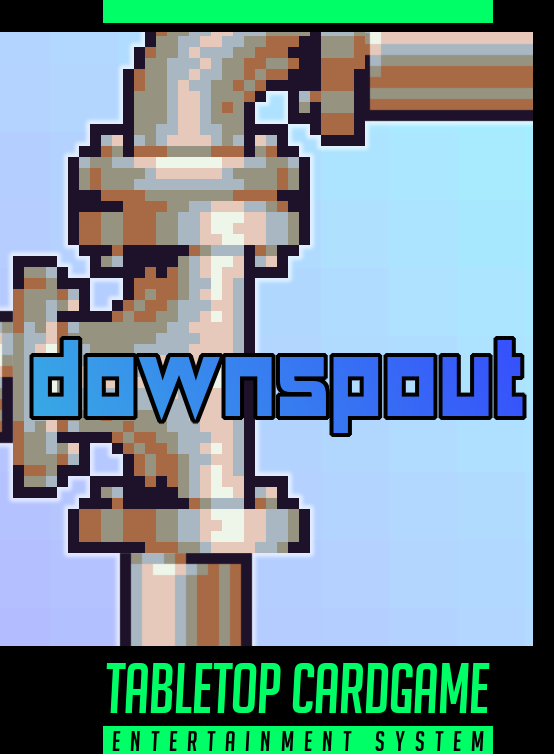 Downspout is a thoughtful strategy game for 2-4 players and needs only space between players for their grid of pipes. For international customers, you may prefer to buy print-on-demand via DriveThruCards (the same printer we use for our local stock). You can buy Downspout at DriveThruCards as a professionally printed card deck. Already bought Burning Daylight? Download the latest revision of the Downspout rulebook. You can also follow us to receive notifications of rules updates!